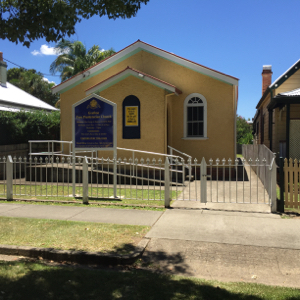 The Grafton Free Presbyterian Church is a congregation within the bounds of the Asia Pacific Presbytery of the Free Presbyterian Church of Scotland. We are evangelical and reformed according to Scripture in doctrine, worship and practice. We believe that the Westminster Confession of Faith accurately summarises the principal doctrines of God's Word. Our lot is cast in a day of much superficial Christianity. Although our society is becoming increasingly secular, there is still a considerable amount of religion associated with Christianity around. The growing number of mega-churches attracting huge assemblies, of mostly young people, is testimony to this. As these churches pump out their music imported from the world’s pop culture, they attract a clientele just as much at home at a large music festival featuring rock, pop, and heavy metal bands whose lyrics often express rebellion, immorality and defiance of God. Anyone looking in from the outside, with no previous church connection and ignorant of biblical teaching, could understandably conclude that it must be the business of the Christian Church to provide high-quality entertainment for the masses. Is it not high time, we stopped to consider what the real business of Christ’s Church is in this twenty-first century? Should we not take time to analyse the content of the message the professing church is conveying to the unchurched about her mission and purpose? Ought we not to ask some serious questions regarding the relationship between the Church and God: where does God and his will fit into the activities of many churches at present? Where is Jesus Christ and apostolic teaching to be found in so much of the semi-religious excitement? Many in the church of today appear to think that the “feel-good factor” is what really counts. “Church leaders” are under an obligation to make their congregations feel good about themselves. Attendees must feel comfortable with their surroundings and enjoy the exhilarating atmosphere. Leaders of the “programme” who are little more than masters of ceremony, manipulate the minds and wills of their admiring, spell-bound audiences into submissive responses. While we acknowledge that social and cultural changes take place in every generation, we do not believe that the character or attributes of God ever alter. As dependent creatures, we remain under the same obligation to worship and obey him as those living in previous generations. The worship which God requires and deserves from us must essentially be acceptable to him. It must be spiritual. If we truly love God, we will endeavour to ensure that it is so. Inquiry is therefore necessary on our part to discover from God himself what worship and service he approves of. This can only be achieved by serious and honest research into God’s revelation—the Bible. It is scripture alone which informs us as to what forms and elements of worship meet with divine approval. Jesus himself, stated: “God is a Spirit: and they that worship him must worship him in spirit and in truth.” John 4:24. Again, drawing from the Old Testament, Jesus spoke of those who come near to God with their lips and words but who are far away from him in their hearts and thoughts. Jesus declared such to be offering vain or false worship to God. Matthew 15:8–9. Because we adhere to an established form, and carefully follow a well-loved and approved liturgy, whether written or unwritten, this does not in itself mean we are engaged in divinely acceptable worship. The worshippers of God ought to have the concern of the Psalmist, who when addressing God prayed: “Let the words of my mouth, and the meditation of my heart be acceptable in thy sight, O LORD, my strength, and my redeemer.” Psalm 19:14. My dear friend is your worship acceptable to God, or is it merely satisfying to you? Do you take God’s worship seriously?